Respiration is the process of releasing energy from the food we take. The respiratory system consists of the nostrils, larynx, pharynx, bronchi, tracheae and lungs. Respiration is the breakdown of absorbed food with the help of oxygen. During this process, carbon dioxide, water and a lot of energy are produced. This energy is made available to the cells of the body. Blood is a fluid connective tissue which is red in colour, alkaline in nature and salty in taste. A human adult under normal condition has 4.7 to 5 liters of blood. Blood consists of 45 % of blood cells and 55% of plasma. Blood circulates continuously in every part of the body. Blood comprises Plasma, Red Blood Cells (RBC), White Blood Cells(WBC), and platelets. Blood cells can flow easily through blood vessels because they are a minute. The human heart is a cone shaped muscular organ formed by cardiac muscular organ formed by cardiac muscles. Its size is similar to that of a closed fist and weighs about 350 grams. 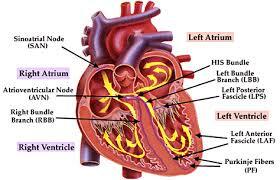 The heart is surrounded by a tough membrane called Pericardium. Our heart has four chambers: two auricles and two ventricles. The right auricle and the right ventricle are connected by tricuspid valves. The left auricle and left ventricle are connected by Bicuspid or Mitral valve. Artery: Arteries carries the oxygenated blood to the different parts of the body, organs and tissues. Except the pulmonary artery, all the other arteries carry oxygenated and pure blood. Capillaries: Arteries further branch out to form small arterioles. These arterioles further branch to form a fine network of blood vessels known as capillaries. Its function is to interconnect the arteriole and venule. Vein: It's function is to transport blood from different parts and organs of the body to the heart. All veins except the pulmonary vein contain deoxygenated blood. The heart is the only organ that pumps blood all over our body. The oxygenated blood pumped out from the left ventricle is carried by aorta which branches into smaller arteries that carry blood to different organs and tissues. These small arteries are further divided into arterioles and capillaries. The capillaries supply blood to all the tissues and organs. The oxygen content of the blood is used up by the cells for respiration. The de-oxygenated blood makes way towards the heart via venules which then unite to form veins. They carry blood back to the right auricle through superior and inferior venacava. Superior Venacava brings impure blood to right auricle from the brain, heart or the upper part of the body and the inferior part of the body brings impure blood to the right auricle from the lower part of the body. As soon as the right auricle is filled with impure blood, the tricuspid valve in between opens. So, the blood moves into the right ventricle. The tricuspid valve closes once the right ventricle is filled with blood. The blood is then pumped towards the pulmonary artery. The pulmonary artery is divided into left and right branches that are joined to the lungs. Through these, blood reaches the alveoli and carbon dioxide passes into the alveoli from the capillaries. This way the process of carrying out carbon dioxide and taking in oxygen into the blood takes place continuously. Respiratory is the process of release of energy from the food we take. The respiratory system consists of the nostrils, larynx, pharynx, bronchi, trachea, and lungs. During this process, carbon dioxide and water are released as water and a lot of energy is produced. This energy is made available to the cells of the body. Explain the process of blood circulation in humans. Blood circulation in humans is carried out in several steps. Firstly, the oxygenated blood pumped out from the left ventricle is carried by aorta which is branched into different arteries. Arteries are further divided into arterioles and capillaries which supply blood to all tissues and organs. The de-oxygenated blood moves to the heart through capillaries, which then unite to form veins. Impure blood is carried back to the right auricle through superior and inferior vena cava. In the contraction of auricles, the impure blood goes to the right ventricle via the tricuspid valve and is pumped out to lungs for oxygenation by right auricle. Lungs provide oxygen to the blood in exchange of carbon dioxide present in deoxygenated blood. The purified blood is then carried to the left auricle by the pulmonary veins. As the left auricle contracts, the blood passes to the left ventricle via bicuspid valve and it pumps the blood out of the heart via the aorta and is distributed to tissues and organs. Briefly describe the types of blood cells. 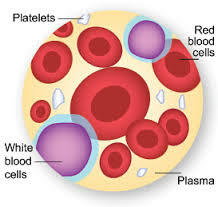 Blood cells are divided into three types.They are; RedBlood Cells (R.B.C) White Blood Cells (W.B.C), Platelets. Red Blood Cells: R.B.C are binocave, in nucleated cells which give red color to the blood. It contains an iron pigment called Haemoglobin which is responsible for the transformation of oxygen. They are formed in bone marrow and aredestroyed in liver and spleen. It is also called erythrocytes. White Blood Cells: W.B.C are also known as the microscopic army of our body which fight against germs and protect us from diseases.They are colorless and larger than RBCs. They are produced in bone marrow and lymph glands. Their lifespan is just about a week. If WBCs increase abnormally and in uncontrolled manner, it is named as Leukemia(Blood Cancer). Platelets: Platelets are the smallest blood cells. They are produced in bone marrow and are responsible for clotting of blood from cuts and wounds. They are also called thrombocytes. Their lifespan is of few days. What are the functions of circulatory system?. It transports the nutrients obtained from the food we ingest. Waste products are transported to the excretory organs by means of blood circulation. It carries oxygen to all our cells. Draw a well-labeled diagram of a human heart. Describe respiration in human beings. The process of respiration in human beings involves two processes. First we take in the oxygen from the atmosphere and the process is called breathing. That oxygen reaches every part of our body (every cell) and inside the cells chemical breakdown of the food (we eat) takes place, in presence of oxygen. In that process, energy and carbon dioxide are liberated. Energy is used by our body to carry out activities and carbon dioxide is thrown out of the body by breathing. Respiration is the breakdown of absorbed food with the help of _______. Which of the following interconnects the arteriole and venules? ______ transports blood from different parts and organs of the body. Which gland controls the other gland? Which one is the biggest part of the brain? Write two functions of heart? Any Questions on 'Respiratory System and Circulatory System '?